By Sarah Ward of Interiors by Sarah Ward. When you are an interior designer you quickly learn that no two rooms are ever the same. Even if two houses are identical, natural light through windows will fall in different ways and interior lighting differs depending on wall colour and furnishings. The team at John Cullen and I have worked together on several projects over a number of years now and it’s a partnership that makes me feel very secure because I can be confident that the finished product will reach the demands of the most exacting client. To illustrate this, I’ll show you a few of the rooms we have worked on together that perfectly demonstrate the importance of achieving the perfect lighting scheme. The living room has to be one of my favourite design schemes. We chose a neutral background with accessories of various textures and finishes. The carefully chosen reflective ornaments give the room depth as they were specifically placed to get a reflection onto the ceiling. 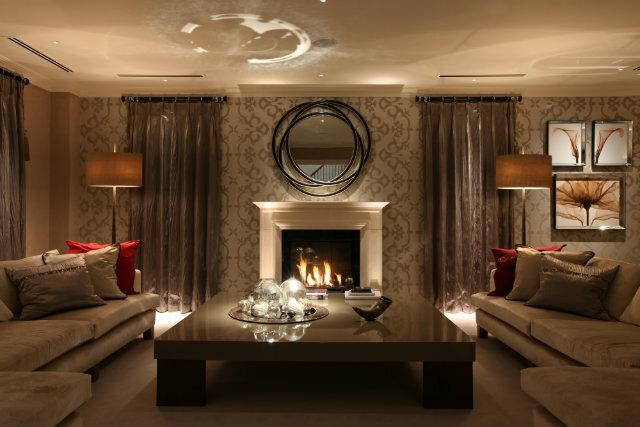 The pools of light work very well with Polespring downlights lighting the coffee table, art and curtains. The fireplace is uplight with two Lucca uplights and task lighting with standard lamps adds warmth in the corners but the room still exudes a relaxed atmosphere, perfect for socialising and entertaining. 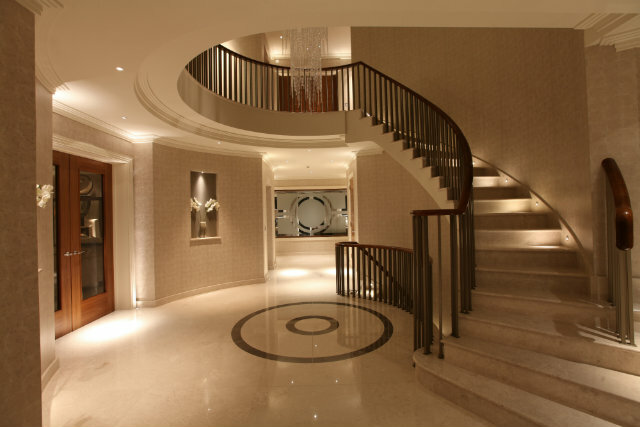 A grand staircase always makes a big statement. Here, the challenge was to make a large bright space feel welcoming and warm, particularly with the coolness of the marble. It was met by using accent lighting on each stair tread using the Riena to create interesting shadows which lead the attention upstairs. The eye is drawn further to illuminated niches lit with Luccas which break up the wall expanse. A white marble bathroom is a classic – yet this bathroom still needed to exude a snug cosiness to counter potential marble chill. The trick was to use excellent lighting. 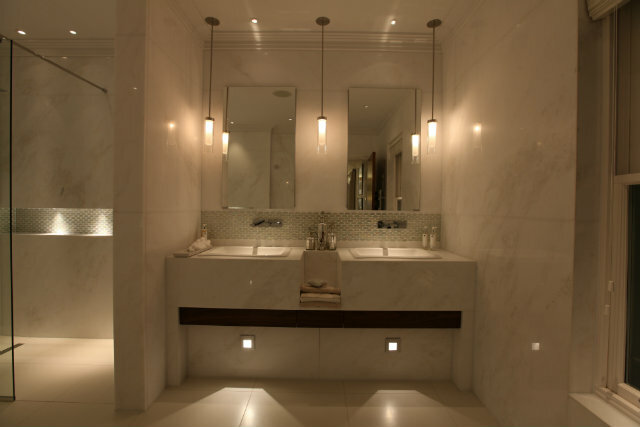 Here the team installed bright ceiling hung Grissini bathroom lights for personal grooming – balanced by calm, mood lighting including the low level Oslo floor washers, for long indulgent soaking in the bath. This dedicated entertaining space was designed to appeal to all ages. The lighting effectively broke it up into zones – defining the bar area, the sofa area and the cinema – with the result that each space gained an individual personality. 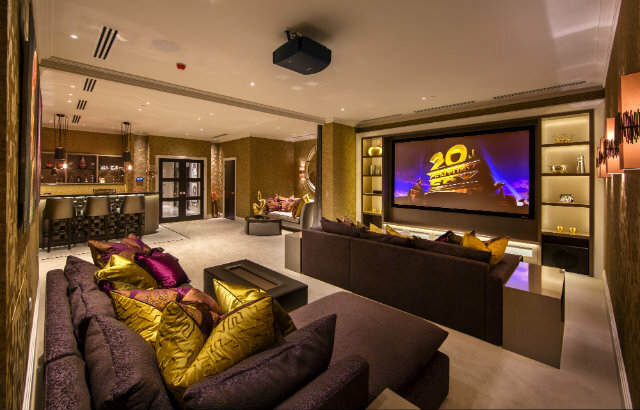 The John Cullen team is exceptional at creating hidden light sources which they did here with back lighting which framed the cinema screen. The entrance to the master suite is given drama by the addition of a crystal chandelier, which casts a large pool of light onto the carpet beneath. Wall lights soften the remaining space, layering levels of brightness and at low level Cazalla floorwashers lead the way at night. 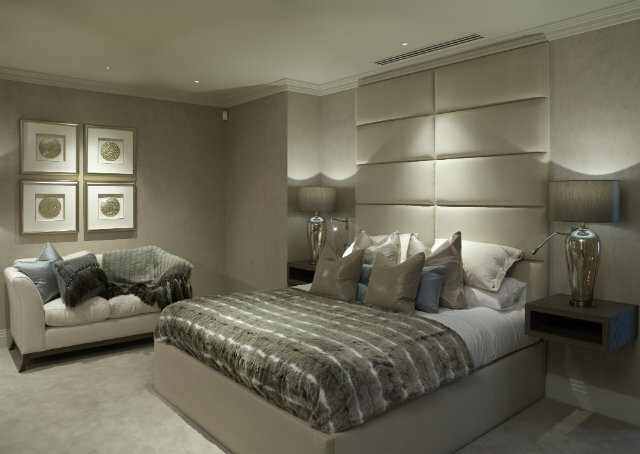 The artwork on the walls of the master bedroom is effectively framed by directional spotlights. At the bedsides we have two layers of lighting offering brightness for reading and ambient light for atmosphere. The Cama bedside lights are independently operated for an individual’s convenience. Learn more about our bespoke lighting design service here. Find out more about Interiors by Sarah Ward here.